I know, I know, it comes round so quickly, it only seems like a few months ago that you were Christmas shopping and hanging up your decorations. But like it or not, Christmas is here again and everyone in the recycling team (all three of us) will be doing our utmost to make the festive period a sustainable and environmentally friendly occasion. So how do you prepare for a greener and more sustainable Christmas when you have to get a tree, put up decorations, buy lots of food and drink and buy and wrap lots of presents? 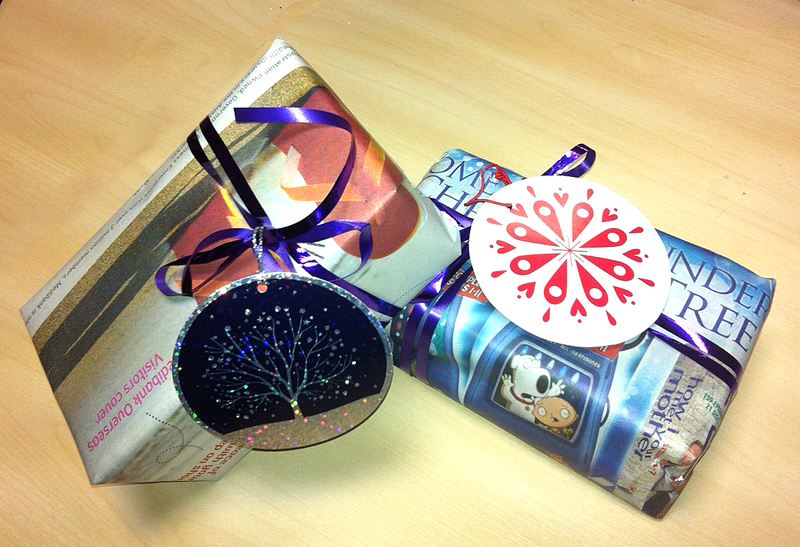 Can you believe these are wrapped in newspaper with the addition of some ribbon and nice tags – simple. Who needs Blue Peter? Well, there are some measures you can take to try and reduce your impact on the Worlds resources at a time of mass consumerism. The following are some ideas and tips that we’ve put together from a wide range of sources that will help you reduce waste, tackle contamination (which is a massive problem in Lewisham) and make your food go a little further without wasting it. One of the early purchases around Christmas time is the tree. What are the options when it comes to deciding on what type of tree to buy and where do you buy it from? Then when you have finished with it, what do you do with it? Well, if you have an artificial tree that’s still in good condition, then use that. 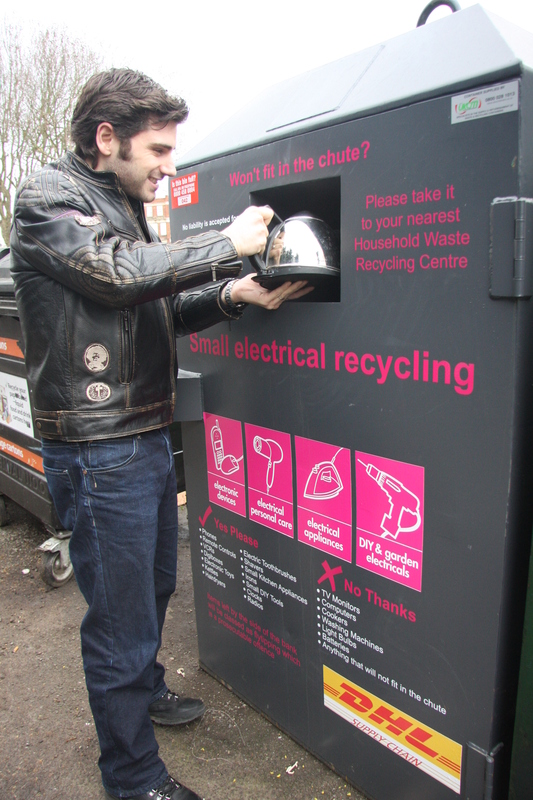 Whilst they are made of PVC and cannot be recycled, if you already have one, then it may as well be put to use. It can also be used year after year after year. You could buy a real tree and leave it at a collection point for mulching or use an artificial one if you already have one. So the tree is up, now the decorations. What about re-purposing old decorations? Sleigh bells from last year that adorned a wreath that you don’t use any more can go on your tree and save you money. Also, if every family reused just two feet of ribbon, the 28,000 miles of ribbon saved could tie a bow around planet Earth? Cheap Christmas ornaments can be made from wine corks. 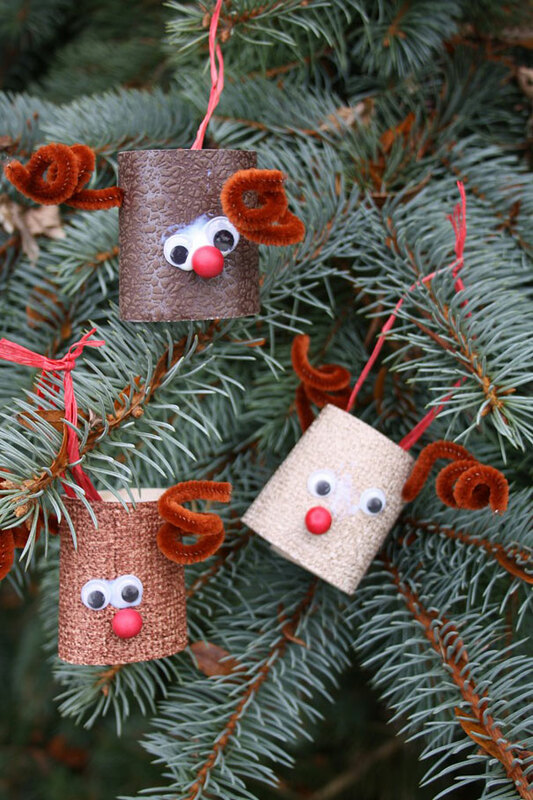 These reindeers for example are cheap and easy to make. 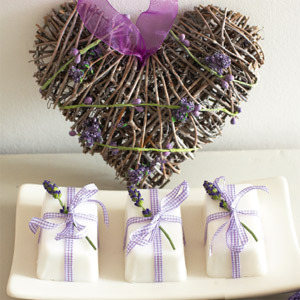 Cheap and fun craft ideas like these are simple to make. Once you have the tree and decorations up, you’ll start thinking about food and drink over the Christmas period. The Recycling Team can’t stress enough how useful the Love Food Hate Waste message is. Figures show that Britons throw out the equivalent of 2m turkeys, 5m Christmas puddings and 74m mince pies. Loving food and hating waste. Make good use of that turkey. And don’t forget to compost. All manner of peelings are generated over Christmas which your compost bin will devour. Its simple and easy. As for the drink, whilst that will keep and won’t be in danger of going off quickly, there are things to think about when it comes to the packaging of those drinks. Christmas generates enormous amounts of plastic and glass bottles, cans, paper and cardboard. Bottles, cans, paper, glass and cardboard only. No food or garden waste please as that causes problems here at the sorting facility. And finally, there’s just the New Years resolution to make. You could start the year on a much greener footing and say that you will recycle more this year and make all efforts to stop contamination of the recycling bins? Did we mention this was a problem? Merry Christmas and a Happy New Year to all Lewisham residents. Categories: Cardboard, community engagement, Uncategorized | Tags: Christmas 2015, christmas and new year recycling in Lewisham, christmas recycling, Christmas recycling in Lewisham, Christmas tree recycling in Lewisham, Christmas tree recyling, christmas waste, Dreaming of a green Christmas, eco christmas, Green Christmas, green christmas in Lewisham, home made wrapping paper, homemade christmas gifts, Lewisham's Christmas tree recycling points, Love food and hate waste at Christmas, love food hate waste, Love Food Hate Waste Christmas tips, recycling at christmas, recycling at christmas 2015, sustainable christmas in Lewisham | Permalink. It doesn’t feel like it was 12 months ago that we were putting together our usual list of tips and hints on how to make your Christmas as environmentally friendly as possible. As with every Christmas, we always notice that there are new things that can be done to reduce waste on all fronts, whether its on present buying, present wrapping or cutting down on the waste associated with food and drink. The following are the recycling teams guide to all residents to help them enjoy a hopefully white Christmas but also a green one too. This topic alone generates a whole range of responses. Some websites say that if you have an artificial tree, then use that rather than buy a real one. Or maybe buy a second hand artificial tree? Failing that you can rent a Christmas tree and if buying a real tree, ensure its UK grown and from a grower registered with the British Christmas Tree Growers Association. 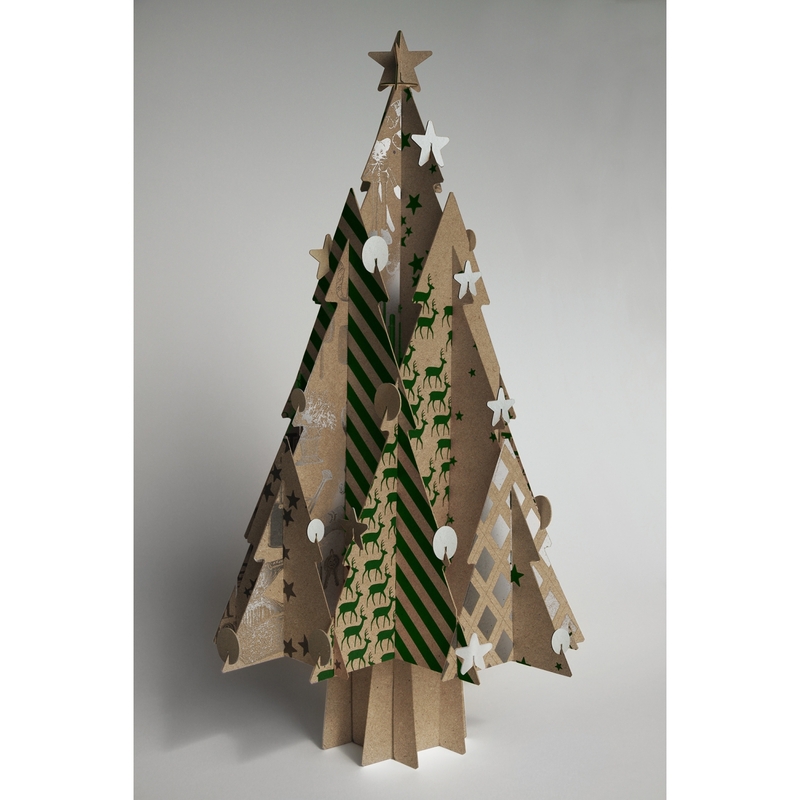 Why not try something really different this year and go for a cardboard Christmas tree? So, now that you’ve sourced your tree from an ethical supplier or dusted down the artificial tree from the loft, you just need to make it look the part in your home without worrying about the damage being done to the environment. 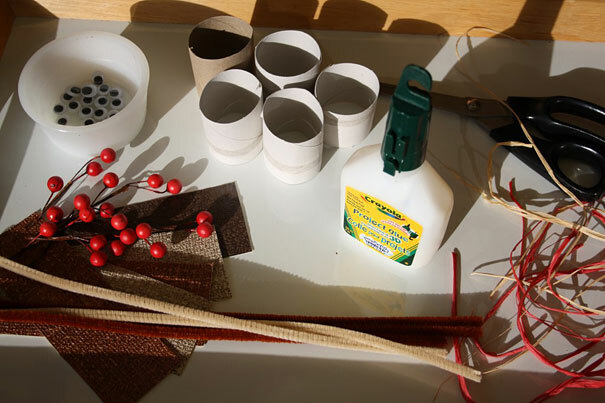 The following link has some great ideas on how to make your own Christmas tree decorations from items that you would on any other day, throw in the bin. Making baubles using old CD’s, turning old light bulbs into Christmas penguins, reindeer’s made out of old toilet rolls? This can also be a fun activity to do with children. There are many websites offering ideas on making gifts that have the added advantage of the gifts not coming in any additional packaging and generating more waste. Presents can also be wrapped in newspaper or in paper from magazines. If some ribbon is used to hold it together, the effect is such that you hardly pay attention to the fact that its not wrapped in proper Christmas wrapping paper. Once the presents have been opened, the wrapping paper can simply then go straight into the recycling bin – which might be the place you want to look to get it from? Here’s some we did earlier in the office. These are wrapped in newspaper with the addition of some ribbon and nice tags – simple. By the afternoon of Christmas Day, presents will have been opened, wrapping paper and packaging will have been recycled and some presents might start to look like it wasn’t quite what you wanted. You might have the option of taking the item back with the receipt which is fine. 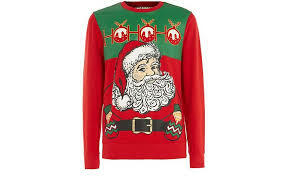 If not, and the item in question is clothing, think about charity shops or a textile bank to ensure the item gets a second chance and will be worn by somebody who wants it. And finally, please remember to leave your bins at the boundary of your property on the correct collection day if you want them emptied. Once they have been emptied, please bring them back in off the street. Last, but not least, Lewisham’s recycling team would like to wish all residents in the borough and a merry Christmas and a happy new year. Categories: WEEE Banks | Tags: cardboard recycling, christmas, christmas clothes recycling, christmas collections, christmas ideas, Christmas in Lewisham, christmas jumpers, Christmas tree recycling in Lewisham, christmas trees, Christmas wrapping paper, clothes recycling, eco christmas, Green Christmas, love food hate waste, Recycling textiles in Lewisham, small appliance banks, textile banks, textile recycling, WEEE Banks | Permalink.